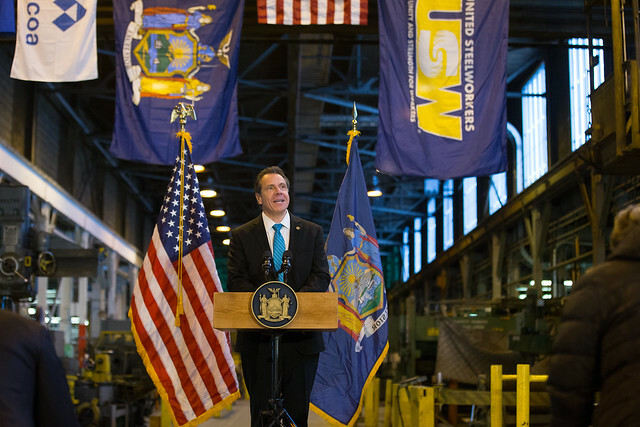 Governor Andrew M. Cuomo today announced that an agreement has been reached with Alcoa that would preserve 450 jobs at the aluminum company's smelting plant in Massena. The new seven-year agreement is subject to approval by the New York Power Authority Board of Trustees, and Governor Cuomo is recommending the Board vote in support of the proposed deal at its meeting on March 26. The new agreement, between Alcoa and the New York Power Authority, extends the previous contract, which expires at the end of the month, through 2026. That contract had included the protection of 145 jobs that are now supported by Arconic, which separated from Alcoa in 2016 but maintained operations at the same site. In December 2018, the Governor announced that Arconic would maintain its workforce through 2028, ensuring a commitment of roughly 600 jobs total between the two companies. Alcoa has once again committed itself to Massena for the long-term through this hallmark agreement, which will protect its workers and the state investments. "This agreement with Alcoa will preserve hundreds of jobs and extend the company's operations in Massena," said Lieutenant Governor Kathy Hochul. "Alcoa's commitment in New York State will maintain the workforce in the area and continue to strengthen the economy of the entire North Country region." Gil C. Quiniones, NYPA president and CEO, said, "Ensuring that this contract agreement extended into the future has been a top priority for Governor Cuomo and the Power Authority. Alcoa is an anchor to the North Country economy and it is critical to help keep the facility operating and employing hundreds of regional workers." Senator Joseph Griffo said, "We are pleased that this deal could be reached and are grateful to the many hardworking and dedicated employees and their families who make the company what it is and the community a special place to live." Senator Patty Ritchie said, "I want to applaud the New York Power Authority and Alcoa for coming together to reach this agreement—which is a victory for the local workforce and the regional economy. Alcoa has a great history in the North Country and protecting its future in Massena is a win-win for our entire region." Assembly Member Mark Walczyk said, "I'm thrilled with the leadership shown by NYPA, the Governor and Alcoa in coming to an agreement that will be a critical investment for the future of Massena."